Amici pinguini amanti delle distro leggere ma solide ecco per voi una interessante notizia ovvero il rilascio di Semplice 5 "High Hopes"! Per chi non lo sapesse Semplice è una distro GNU/Linux made in Italy realizzata da Eugenio, Luca e Giuseppe, tre ragazzi italiani accomunati dalla passione per il software libero. 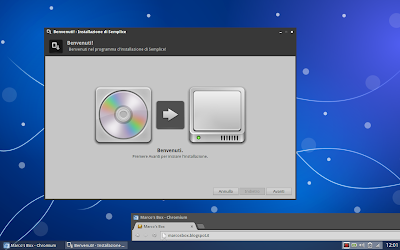 Semplice è basata su Debian unstable ("sid") e Openbox 3.5.0 ed ha come obiettivo il rilascio di una distro semplice (da qui il nome), veloce, leggera e graficamente curata. Una delle novità più importanti di Semplice 5 è l'aggiunta del supporto all'UEFI e quello alle LVM durante l'installazione. bricks now permits to remove only a part of a feature. The old panel has been replaced with a new, modern-looking one. oneslip is a WebKit2-based viewer made with the aim to integrate Web 2.0 applications with the system. Example web applications distributed in Semplice 5 are Facebook, Twitter, YouTube and a Tetris game. The user could add more via the “Add web application” menu item. The installer now supports LVM and LVM on LUKS (encrypted LVM). The cipher defaults to aes-xts-plain64 and the key-size to 512. To change those, the user needs to start the installer with the :partdisks:cipher:<new_cipher> argument to change the chiper and the :partdisks:keysize:<keysize> argument to change the key-size. The images and installer now support UEFI-powered machines. Secure boot is not supported and thus it's needed to disable it to install and boot Semplice. The installer will automatically create a 40 MB fat16 /boot/efi partition if using the automatic partitioning tools. Some firmwares may not boot if the /boot/efi is less than 512 MB, so in this case the user needs to use the manual partitioning scene and create the partition manually. The dynamic-menu generator got some bugfixes, and now it uses higher-size icons to get a better-looking menu. Also, it's now possible to disable the header. Notifications are now in the bottom-right corner of the screen by default. The lightdm greeter now uses the SempliceDark theme. guake and xterm have been removed from the standard distribution. Many bug fixes and little enhancements.